Bijou Bay Harbor, the new luxury boutique condominium developed by Ability by Acierto on Bay Harbor Islands in South Florida, has topped off construction at 75 feet. The nine-story waterfront property at 9521 East Harbor Bay Drive is slated for completion in July 2019. Bay Harbor Islands, FL, February 14, 2019 --(PR.com)-- Bijou Bay Harbor, the luxury boutique condominium developed by Ability by Acierto on Bay Harbor Islands, has topped off at 75 feet. The nine-story waterfront property at 9521 East Harbor Bay Drive is slated for completion in July 2019. The project was designed by Revuelta Architecture International and interior designer Adriana Hoyos, as a quiet island sanctuary with sleek lines and open spaces flooded with natural light. Bijou Bay Harbor houses 41 luxurious and private residences, including five penthouses, ranging from 900 to 2,100 square feet. Residents will enjoy boutique island living and casual elegance with amenities that include a sky lounge with pools, fire pits, seating areas, and unobstructed intracoastal views. Coastland Construction is the general contractor for the project. Bijou Bay Harbor broke ground in June 2017. Construction is estimated to cost a total of $20 million. Bijou Bay Harbor is the first South Florida development for Ability by Acierto, a partnership between Conexo Inmobiliario, led by Andres Arias, and Acierto Inmobiliario, Colombia’s second-largest developer founded by Juan Carlos Gonzalez. The firm has successfully built 10 million square feet of residential and commercial projects. Ability by Aciertois also developing Vista Lago, comprising 113 townhomes in Miami Gardens, scheduled to break ground in the Summer of 2019. The Town of Bay Harbor Islands is a walkable, urban enclave boasting upscale retail and dozens of restaurants, while the bustling Kane Concourse and the affluent shopping of Bal Harbour Shops are just steps over the Intracoastal Waterway. The location offers convenient access to Surfside, Aventura and Miami Beach. Prices at Bijou Bay Harbor begin in the mid-$600,000's and rise to $2 million for the penthouses. The project is 95 percent sold. Bijou Bay Harbor’s sales center is located at 1050 Kane Concourse. 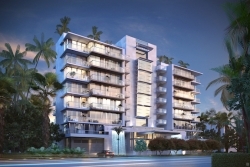 For more information, please call (305) 864-2220 or visit www.bijoubayharbor.com.